The BalanceWear® Classic BW300 Postural Control and Stabilizing Balance Vest promotes trunk stability, balance and stability and may improve confidence in daily activities. 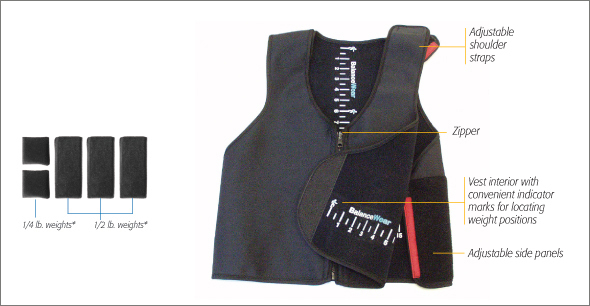 Flexible, small lightly weighted inputs are strategically placed in the vest according to the individual patient’s postural control and stability requirements, specifically tailored to rebalance losses. The BalanceWear® Classic is made from a two-layer laminate of nylon mini mesh/UBL. Click here to view our BalanceWear® Measuring Guide video. This two-layer device is for patients with mobility difficulties associated with loss of postural control and loss of balance regardless of the underlying neurologic or orthopedic cause. 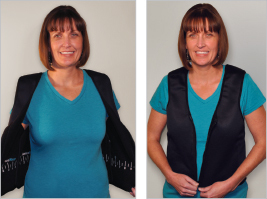 Do not change the location of the weighted inputs once placed by a BalanceWear® trained therapist or disassemble the vest. Customized for individual patient use; Do not let others use this device. If you should feel less stable, immediately discontinue use of your BalanceWear® and notify your BalanceWear® therapist or patient care representative to schedule a re-assessment. NOTE: BalanceWear® does not claim to cure or be effective in treating any disease.